Last month I was looking for some new business. I ended up reaching out to yet another metal manufacturer, this one located on the East Coast. 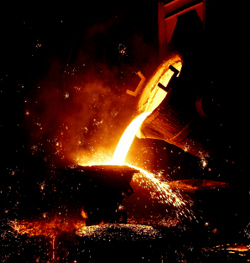 They were producing specialty metals for equipment manufacturers and industrial companies. I eventually got in touch with Ken, the predictive maintenance technician, and I inquired about how they were managing the lube oil for their machinery. It turned out that I called at just the right time since they were having an issue with one of their metal processing machines. Ken and the other technicians were using high-viscosity gear oil on one of their metal processor’s chuck heads, in the forging area. Extremely high heat, engine vibrations, and the general nature of this metal-shaping process causes a good amount of wear on the components, and the metal particles often get into the gear oil reservoir. These metal particles then recirculate through the machine, which causes premature pump failures. When the pumps fail the machine stops. This down time results in a loss of revenue and expensive repairs. Not good. In order to help Ken and his company as soon as possible, I visited the plant and conducted a test using ISO 680 gear oil from the chuck head that had the seized pump. I connected our liquid cartridge portable filter cart (PDF) with a 50-micron filter element (the size recommended by the manufacturer of the metal processing machine) to the oil tote in a kidney-loop configuration. I then ran the lube oil through our filter cart for several hours. Immediately after I started up the cart I took a sample of unfiltered oil in order to obtain a baseline reading. I subsequently took two more oil samples during the filtering process in order to verify the efficiency of the filter media. Ken was rather pleased with the results. As a final solution for preventative maintenance, I recommended that they consider installing the LCFC as a dedicated stationary kidney-loop system for continuous in-line filtration of each chuck head. Ken took my advice, and he requested to start out with not just one but two LCFC filter carts so he could maximize versatility and availability of the units in the plant. Good thing I reached out to them! 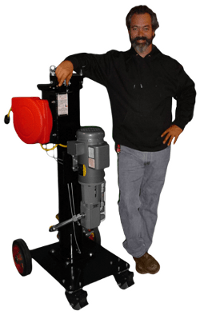 Do you have a question about filtering lube oil or mobile filtration systems? Feel free to contact us anytime. Our friendly team of experts will be happy to help you out with your particular issue.